The first in a series of articles about Nano / Raiblocks / XRB / the block lattice. 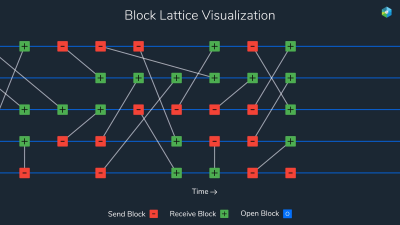 It’s a 7 part series in which we take a deep dive into the block lattice, how it works and why it is a true innovation of blockchain technology. Don’t worry, this article is light and just gives you a high level overview with some pros and cons as well as a video demonstration (not my video) of how fast it really works. I’ve split it into 7 parts just to keep the topics light (since they can be complicated) while still being able to provide a good in depth view, happy reading! The block lattice is a different and relatively new approach to blockchain technology, developed by the team that launched Nano (formally known as RaiBlocks). The main reason I like this approach is because of their use of the double entry accounting principle that has been tried and tested for many years, which results in a lot of added advantages to traditional blockchain technologies, as well as the block lattice’s scalability and speed. This blog post outlines the basic principles and characteristics, while subsequent posts will take a deep dive into the block lattice, it’s inner workings, long term adoption possibilities and attack resistance. For every transaction on the network, two blocks are created. A send transaction subtracts from your current account balance and then a receive transaction, confirmed by the recipient, adds to the receiver’s balance. For the transaction to be completed, the recipient will need to sign the block and broadcast to the network (where voting blocks confirm until you reach 50% vote quorum). These two actions do not have to happen at the same time as the block lattice operates completely asynchronously. Nano completely cuts out the need of miners by requiring the sender and receiver to verify the transactions which gives tremendous speed advantages. They do have a consensus mechanism in case of conflict, through representative voting, but even this process only takes a matter of seconds and only kicks in at times of conflict, the rest of the time this is dormant (99% o/t time). It is extremely fast, can handle a large number of transactions per second and is miner-less and fee-less. Voting through representative blocks (users delegate their voting power, similar to EOS), you need a sufficient number of representatives and they need to have sufficient weight each as well as being trusted. No implementation for smart contracts. Intrigued? Read my upcoming blog posts for details on how it works exactly, in the mean time take a quick look at their transaction speed from a Nano wallet (Canoe) to a desktop wallet (also Canoe), the video shows you the use of the wallet as well as the transaction speed, don’t blink!